"The weather over Hiroshima: clear." 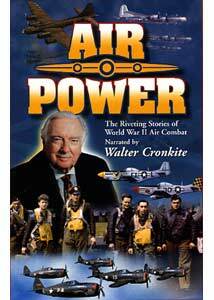 Air Power is an extensive documentary originally broadcast in the Fifties and describes in great detail the impact of the "fighting machines of the air" on World War II. Narrated by Walter Cronkite, the more than 6 hours contain extensive footage from the war and, as much as the attention is focused on the mechanical, the men who fixed and flew also get their due. Volume 1 sets the stage with an analysis of the enemy Air Force, The Luftwaffe, and events early in the war, particularly the Battle of Britain. Following the blitzkrieg that conquered the lower countries and France, Hitler's Germany turned its sights on the British Isles and the amazing stories of England's struggle against the bombing raids with grit, determination and newly invented radar, is engagingly told. As the tide of the war turned, the story of Air Power becomes an allied one in Europe. Germany could not replace its losses and massive bombing raids began to pound the civilian and military targets of the German homeland. The style of documentary here is very patriotic and does not seek to question tactics or methods used in winning the war. The selection of targets, the bombing of civilian targets and the failure to bomb the train lines carrying Holocaust victims to the death camps is not analyzed. However, the time these documentaries were made was a different era and World War II was a different kind of war. There is a zen quality to watching these lengthy films as they include many sequences that don't have any narration and just show scenes of the war with musical accompaniment. This is also a different style of documentary with no talking heads, but rather copious amounts of authentic war footage. There is very little up-close death shown; only rarely do we see a dead body. Volume 2 follows the final drive to victory in Europe and the beginnings of the conflict in the Pacific with the sneak attack at Pearl Harbor. The defeat of the Japanese is the focus of Volume 3 and shows the difficulties of fighting an air war in the Pacific, the terror of the Kamikaze suicide tactics and the dropping of the atom bomb on Japan. A great deal of footage from the Japanese side of the war is included. Some of the films did not seem authentic but rather seems to be either a reconstruction or just came off as looking fake, but I could find nothing to confirm whether the film was or was not completely real footage from the war. No punches are pulled in describing the horrific effects of American incendiary bombing of the Japanese home islands. The sad aspect of Japanese refusal to surrender even in the face of inevitable defeat forces the American military to plan the invasion of Japan and then, in the face of potential unacceptable casualties, ultimately supercede it with the dropping of the atomic bomb. Some obvious atomic bomb test footage is used here. Aficionados of military history and particularly the history of air warfare will find much to enjoy in the set. The narration is well written and complements the footage nicely. Commentary from soldiers' letters is also included to add authenticity. Analysis of battle strategy keeps the timeline of the war in context and provides an interesting primer in what has become the way modern war is fought. There is not much grappling with the moral implications of decisions taken in fighting the Second World War, but again, it was a different time. Image Transfer Review: The full-frame presentation gives a good account of itself in making film that is so old and from so many sources appear watchable. Mostly black & white, with occasional color, Air Power shows the importance of DVD in preserving this rare footage from the past in permanent digital version. Audio Transfer Review: Decent audio that only occasionally sounds a little tinny. A great deal of work was done in the original synching up sound effects, music and narration and, no doubt, it has never sounded better. Good job for the project. Extras Review: Additional information is provided in the form of featurettes focusing on a particular aspect of aviation. Included are: Fighters of the RAF, Defenders of the Reich, B-17 Flying Fortress, P-51 Mustang, P-47 Thuderbolt and B-24 Liberator. Nice bits of history in each. Copious amounts of authentic war footage and the excellent narration of Walter Cronkite makes this a great learning experience. The history of air combat from World War II is told with detail and interest. Recommended for war buffs of all ages.